For the first time, scientists have demonstrated that an organism devoid of a nervous system is capable of learning. Biologists have succeeded in showing that a single-celled organism, the protist, is capable of a type of learning called habituation. This discovery throws light on the origins of learning ability during evolution, even before the appearance of a nervous system and brain. It may also raise questions as to the learning capacities of other extremely simple organisms such as viruses and bacteria. For the first time, scientists have demonstrated that an organism devoid of a nervous system is capable of learning. A team from the Centre de Recherches sur la Cognition Animale (CNRS/Université Toulouse III — Paul Sabatier) has succeeded in showing that a single-celled organism, the protist Physarum polycephalum, is capable of a type of learning called habituation. This discovery throws light on the origins of learning ability during evolution, even before the appearance of a nervous system and brain. It may also raise questions as to the learning capacities of other extremely simple organisms such as viruses and bacteria. These findings are published in the Proceedings of the Royal Society B on 27 April 2016. An ability to learn, and memory are key elements in the animal world. Learning from experiences and adapting behavior accordingly are vital for an animal living in a fluctuating and potentially dangerous environment. This faculty is generally considered to be the prerogative of organisms endowed with a brain and nervous system. However, single-celled organisms also need to adapt to change. Do they display an ability to learn? Bacteria certainly show adaptability, but it takes several generations to develop and is more a result of evolution. A team of biologists thus sought to find proof that a single-celled organism could learn. They chose to study the protist, or slime mold, Physarum polycephalum, a giant cell that inhabits shady, cool areas and has proved to be endowed with some astonishing abilities, such as solving a maze, avoiding traps or optimizing its nutrition. But until now very little was known about its ability to learn. During a nine-day experiment, the scientists thus challenged different groups of this mold with bitter but harmless substances that they needed to pass through in order to reach a food source. Two groups were confronted either by a “bridge” impregnated with quinine, or with caffeine, while the control group only needed to cross a non-impregnated bridge. Initially reluctant to travel through the bitter substances, the molds gradually realized that they were harmless, and crossed them increasingly rapidly — behaving after six days in the same way as the control group. The cell thus learned not to fear a harmless substance after being confronted with it on several occasions, a phenomenon that the scientists refer to as habituation. After two days without contact with the bitter substance, the mold returned to its initial behavior of distrust. Furthermore, a protist habituated to caffeine displayed distrustful behavior towards quinine, and vice versa. Habituation was therefore clearly specific to a given substance. Habituation is a form of rudimentary learning, which has been characterized in Aplysia (an invertebrate also called sea hare). This form of learning exists in all animals, but had never previously been observed in a non-neural organism. This discovery in a slime mold, a distant cousin of plants, fungi and animals that appeared on Earth some 500 million years before humans, improves existing understanding of the origins of learning, which markedly preceded those of nervous systems. It also offers an opportunity to study learning types in other very simple organisms, such as viruses or bacteria. This single cell, which contains thousands of nuclei, can cover an area of around a square meter and moves within its environment at speeds that can reach 5 cm per hour. Mild tactile stimulation of the animal’s siphon normally causes the defensive reflex of withdrawing the branchiae. If the harmless tactile stimulation is repeated, this reflex diminishes and finally disappears, thus indicating habituation. Summary: Anthropologists are studying the ancient and modern human micro biome and the role it plays in human health and disease. By applying genomic and proteomic sequencing technologies to ancient human microbiomes, such as coprolites and dental calculus, as well as to contemporary microbiomes in traditional and industrialized societies, Researchers are advancing the understanding of the evolutionary history of our microbial self and its impact on human health today. University of Oklahoma anthropologists are studying the ancient and modern human microbiome and the role it plays in human health and disease. By applying genomic and proteomic sequencing technologies to ancient human microbiomes, such as coprolites and dental calculus, as well as to contemporary microbiomes in traditional and industrialized societies, OU researchers are advancing the understanding of the evolutionary history of our microbial self and its impact on human health today. Christina Warinner, professor in the Department of Anthropology, OU College of Arts and Sciences, will present, “The Evolution and Ecology of Our Microbial Self,” during the American Association for the Advancement of Science panel on Evolutionary Biology Impacts on Medicine and Public Health, at 1:30 pm, Sunday, Feb. 14, 2016 in the Marriott Marshall Ballroom West, Washington, DC. Warinner will discuss how major events, such as the invention of agriculture and the advent of industrialization, have affected the human microbiome. Warinner and colleague, Cecil M. Lewis, Jr., co-direct OU’s Laboratories of Molecular Anthropology and Microbiome Research and the research focused on reconstructing the ancestral human oral and gut microbiome, addressing questions concerning how the relationship between humans and microbes has changed through time and how our microbiomes influence health and disease in diverse populations, both today and in the past. Warinner and Lewis are leaders in the field of paleogenomics, and the OU laboratories house the largest ancient DNA laboratory in the United States. Warinner is pioneering the study of ancient human microbiomes, and in 2014 she published the first detailed metagenomics and metaproteomic characterization of the ancient oral microbiome in the journal Nature Genetics. In 2015, she published a study on the identification of milk proteins in ancient dental calculus and the reconstruction of prehistoric European dairying practices. In the same year, she was part of an international team that published the first South American hunter-gatherer gut microbiome and identified Treponema as a key missing ancestral microbe in industrialized societies. Associação simbiótica entre protozoário e bactéria ajuda a entender a origem dos eucariotos – organismos com material genético compartimentalizado no núcleo da célula. Os parasitologistas Cristina Motta e Sergio Schenkman explicam essa relação. Summary: Don’t have room for dessert? The bacteria in your gut may be telling you something. Twenty minutes after a meal, gut microbes produce proteins that can suppress food intake in animals, reports a study. The researchers also show how these proteins injected into mice and rats act on the brain reducing appetite, suggesting that gut bacteria may help control when and how much we eat. These are neurons (c-fos, green) in the rat central amygdala activated by E. coli proteins in stationary phase and surrounded by nerve terminals (calcitonin gene-related peptide, red) originating from anorexigenic brainstem projections. Credit: J. Breton, N. Lucas & D. Schapman. The new evidence coexists with current models of appetite control, which involve hormones from the gut signalling to brain circuits when we’re hungry or done eating. The bacterial proteins–produced by mutualistic E. coli after they’ve been satiated–were found for the first time to influence the release of gut-brain signals (e.g., GLP-1 and PYY) as well as activate appetite-regulated neurons in the brain. Mealtime brings an influx of nutrients to the bacteria in your gut. In response, they divide and replace any members lost in the development of stool. The study raises an interesting theory: since gut microbes depend on us for a place to live, it is to their advantage for populations to remain stable. It would make sense, then, if they had a way to communicate to the host when they’re not full, promoting host to ingest nutrients again. In the laboratory, Fetissov and colleagues found that after 20 minutes of consuming nutrients and expanding numbers, E. coli bacteria from the gut produce different kinds of proteins than they did before their feeding. The 20 minute mark seemed to coincide with the amount of time it takes for a person to begin feeling full or tired after a meal. Excited over this discovery, the researcher began to profile the bacterial proteins pre- and post-feeding. They saw that injection of small doses of the bacterial proteins produced after feeding reduced food intake in both hungry and free-fed rats and mice. Further analysis revealed that “full” bacterial proteins stimulated the release of peptide YY, a hormone associated with satiety, while “hungry” bacterial hormones did not. The opposite was true for glucagon-like peptide-1 (GLP-1), a hormone known to simulate insulin release. The investigators next developed an assay that could detect the presence of one of the “full” bacterial proteins, called ClpB in animal blood. Although blood levels of the protein in mice and rats detected 20 minutes after meal consumption did not change, it correlated with ClpB DNA production in the gut, suggesting that it may link gut bacterial composition with the host control of appetite. The researchers also found that ClpB increased firing of neurons that reduce appetite. 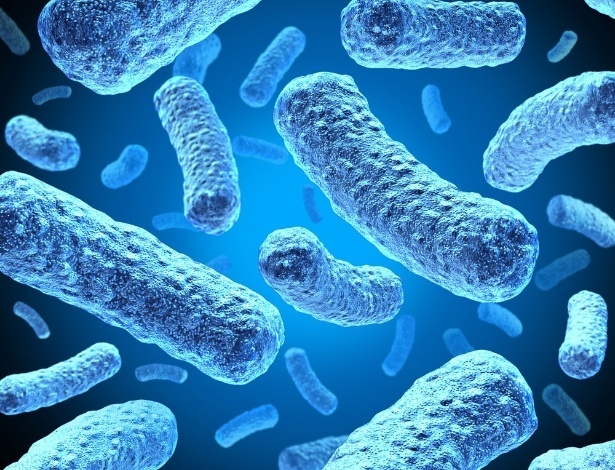 The role of other E.coli proteins in hunger and satiation, as well as how proteins from other species of bacteria may contribute, is still unknown. To understand and harness the capabilities of Earth’s microbial ecosystems, nearly fifty scientists propose a national effort in the US called the Unified Microbiome Initiative. Microbes are essential to life on Earth. They’re found in soil and water and inside the human gut. In fact, nearly every habitat and organism hosts a community of microbes, called a microbiome. What’s more, microbes hold tremendous promise for innovations in medicine, energy, agriculture, and understanding climate change. Scientists have made great strides learning the functions of many microbes and microbiomes, but this research also highlights how much more there is to know about the connections between Earth’s microorganisms and a vast number of processes. Deciphering how microbes interact with each other, their hosts, and their environment could transform our understanding of the planet. It could also lead to new antibiotics, ways to fight obesity, drought-resistant crops, or next-gen biofuels, to name a few possibilities. To understand and harness the capabilities of Earth’s microbial ecosystems, nearly fifty scientists from Department of Energy national laboratories, universities, and research institutions have proposed a national effort called the Unified Microbiome Initiative. The scientists call for the initiative in a policy forum entitled “A unified initiative to harness Earth’s microbiomes” published Oct. 30, 2015, in the journal Science. The Unified Microbiome Initiative would involve many disciplines, including engineering, physical, life, and biomedical sciences; and collaborations between government institutions, private foundations, and industry. It would also entail the development of new tools that enable a mechanistic and predictive understanding of Earth’s microbial processes. Among the authors of the Science article are several scientists from the Department of Energy’s Lawrence Berkeley National Laboratory (Berkeley Lab). These are Berkeley Lab Director Paul Alivisatos; Eoin Brodie, Deputy Director of the Climate and Ecosystem Sciences Division; Mary Maxon, the Biosciences Area Principal Deputy; Eddy Rubin, Director of the Joint Genome Institute; and Peidong Yang, a Faculty Scientist in the Materials Sciences Division. Alivisatos is also the Director of the Kavli Energy Nanoscience Institute, and Yang is the Co-Director. Berkeley Lab has a long history of microbial research, from its pioneering work in metagenomics at the Joint Genome Institute, to the more recent Microbes to Biomes initiative, which is designed to harness microbes in ways that protect fuel and food supplies, environmental security, and health. The call for the Unified Microbiome Initiative comes at a critical time in microbial research. DNA sequencing has enabled scientists to detect microbes in every biological system, thriving deep underground and inside insects for example, and in mind-boggling numbers: Earth’s microbes outnumber the stars in the universe. But to benefit from this knowledge, this descriptive phase must transition to a new phase that explores how microbial communities function, how to predict their actions, and how to make use of them. “Technology has gotten us to the point where we realize that microbes are like dark matter in the universe. We know microbes are everywhere, and are far more complex than we previously thought, but we really need to understand how they communicate and relate to the environment,” says Brodie. “And just like physicists are trying to understand dark matter, we need to understand the functions of microbes and their genes. We need to study what life is like at the scale of microbes, and how they relate to the planet,” Brodie adds. Tools to understand the biochemical functions of gene products, a large portion of which are unknown. Technologies that quickly generate complete genomes from individual cells found in complex microbiomes. Imaging capabilities that visualize individual microbes, along with their interactions and chemical products, in complex microbial networks. Adaptive models that capture the complexity of interactions from molecules to microbes, and from microbial communities to ecosystems. Many of these new technologies would be flexible platforms, designed initially for microbial research, but likely to find uses in other fields. Ten years after the launch of the Unified Microbiome Initiative, the authors of the Science article envision an era in which a predictive understanding of microbial processes enables scientists to manage and design microbiomes in a responsible way–a key step toward harnessing their capabilities for beneficial applications. Um músico brasileiro apresentou na Grã-Bretanha um dueto inédito: no piano, ele interagiu com um fungo. E mofo toca música? Nas mãos de Eduardo Miranda, sim. Especialista em música computadorizada, ele transformou a decomposição em composição: seu novo trabalho usa culturas do fungo Physarum polycephalumcomo um componente central de um biocomputador interativo, que recebe sinais de som e envia de volta as respostas. “A composição, Biocomputer Music, se desenvolve como uma interação entre mim e a máquina Physarum,” disse Miranda. Brasileiro de Porto Alegre, Miranda leciona na Universidade de Plymouth, na Inglaterra. 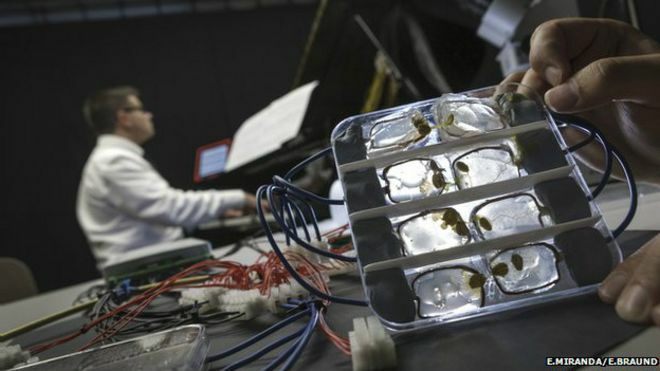 Ele disse à BBC Brasil que Heitor Villa-Lobos tem uma grande inflluência em sua obra e que gostaria de levar a apresentação Biocomputer para o Brasil, mas que, por enquanto, questões técnicas impedem que ele viaje com o equipamento. 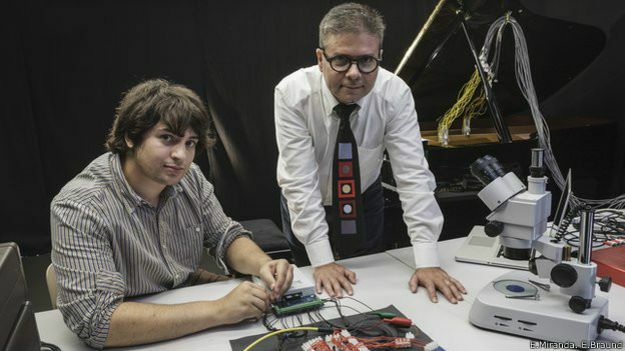 O mofo Physarum forma um componente eletrônico vivo e mutante em um circuito que processa sons captados por um microfone treinado no piano. Pequenos tubos formados pelo Physarum têm a propriedade elétrica de agir como uma resistência variável que muda de acordo com tensões aplicadas anteriormente, de acordo com Ed Braund, aluno de doutorado no Centro Interdisciplinar de Computer Music Research na Universidade de Plymouth. “As notas de piano são transformados em uma onda elétrica complexa que enviamos através de um desses túbulos Physarum. A resistência Physarum muda em função das entradas anteriores, e as notas musicais viram, então, uma nova saída que é então enviada de volta para o piano. O biocomputador atua como um dispositivo de memória”, acrescenta Miranda. Enquanto o pianista toca piano na forma convencional, utilizando as teclas, o biocomputador induz notas por pequenos eletroímãs que pairam milímetros acima das cordas de metal, imbuindo a música com um tom etéreo. Miranda compara seu uso de um biocomputador às técnicas “aleatórias” do compositor de vanguarda americano John Cage (1912-1992), que se voltou para o livro chinês de mudanças i-ching e ao lançamento de dados para controlar partes de suas composições. Miranda vem explorando há algum tempo o uso de computadores em peças interativas de composições eletrônicas, mas valoriza a simplicidade do processador Physarum. A estreia de Biocomputer Music ocorreu no Peninsular Arts Contemporary Music Festival “Biomusic” no dia 1º de março. É de deixar qualquer um espantado: 90% das células presentes no nosso corpo não são humanas. Em outras palavras, você é muito mais micróbios do que você mesmo. Esses “invasores”, embora “invisíveis”, são fundamentais para o nosso equilíbrio. Mas qualquer deslize nesse ecossistema pode causar doenças, muitas delas graves. Por isso, não se descuide: o perigo mora dentro de você e também fora, na superfície da sua pele. Especialista no tema, o pesquisador Luis Caetano Antunes, da Escola Nacional de Saúde Pública Sergio Arouca, da Fundação Oswaldo Cruz, explica que os seres humanos são colonizados por mais de 35 mil espécies diferentes de bactérias, segundo algumas estimativas. “Lembrando que esse número não leva em conta vírus, protozoários etc”, esclarece. Considerando apenas um indivíduo, a estimativa é de mais de mil espécies diferentes. “Já se você considerar cepas (que são indivíduos pertencentes à mesma espécie, mas com características peculiares), esse número sobe para mais de 7 mil”, diz. Se você pudesse colocar todas elas numa balança, os ponteiros marcariam aproximadamente 1 kg. Essa microbiota (flora e fauna microscópica de uma região) é formada assim que chegamos ao mundo. Antunes afirma, inclusive, que bebês nascidos por parto normal têm micróbios diferentes daqueles que nascem por cesariana, pois o contato com o canal vaginal da mãe funciona como um “primeiro banho” de micro-organismos. Apesar de se estabilizar depois que a pessoa completa 1 ano de idade, a população de micro-organismos está sempre em evolução, graças ao contato com o ambiente externo. Assim, a variedade e a quantidade são maiores em locais mais expostos, como boca, pele, olhos, estômago, intestino, tratos respiratórios, genitais e urinários. A parte do nosso corpo mais colonizada é de longe o intestino, com 70% do total de bactérias, segundo o pesquisador. “Um dos motivos é que o intestino possui uma quantidade grande de nutrientes para as bactérias. Além disso, ainda existem secreções, células humanas mortas etc”, diz Luis Caetano Antunes. O especialista também chama atenção para o tamanho desse órgão, que é cheio de vilosidades (dobras, basicamente). “O intestino humano, quando esticado, tem área equivalente a uma quadra de tênis, ou cerca de 200 metros quadrados”, informa. Médicos, cientistas e nutricionistas têm alertado para a importância da microbiota intestinal. Não é à toa que produtos com lactobacilos se tornaram mais comuns nas prateleiras dos supermercados. Antunes descreve três funções principais desse exército de micróbios. A primeira é a nutrição: “Os micro-organismos intestinais auxiliam na degradação de nutrientes que o ser humano, sozinho, não conseguiria degradar”, diz. Além disso, eles produzem substâncias, como vitaminas, que nós não produzimos, e afetam as células para que elas consigam extrair mais energia da dieta. A segunda é treinar o sistema imunológico, fazendo-o identificar o que representa ou não uma ameaça ao nosso organismo. “Um exemplo dessa função vem da observação de que hoje em dia as taxas de doenças relacionadas ao sistema imune (doenças alérgicas, principalmente) está muito mais alta, e isso tem sido associado ao uso indiscriminado de antibióticos, aumento no número de partos por cesariana e excesso de limpeza”, comenta o pesquisador. Um dos primeiros cientistas a observar a existência de comunidades de bactérias em nosso corpo foi o holandês Antonie van Leeuwenhoek, que no século 17 analisou um raspado da superfície de seus dentes e descobriu um grande número de seres vivos minúsculos. Uma organização também holandesa, chamada TNO, divulgou recentemente, após um estudo, que nossa boca abriga cerca de 700 variedades diferentes de bactérias. Os pesquisadores descobriram que um único beijo de língua é capaz de transferir 80 milhões de bactérias de uma boca para outra. Os dados foram publicados na revista Microbiome. Algumas pessoas podem ficar enojadas, mas a verdade é que beijar pode ser uma maneira de fortalecer o sistema imunológico, tomando por base a lógica descrita pelo pesquisador da Fiocruz. Se os micróbios do intestino representam um exército estratégico dentro do corpo, os que habitam nossa pele são a linha de frente. “É a armadura que nos protege contra agentes externos”, considera o médico Jayme de Oliveira Filho, vice-presidente da Sociedade Brasileira de Dermatologia. Assim como na selva a falta de leões pode levar ao excesso de zebras, qualquer desequilíbrio na microbiota da pele pode levar a problemas variados. A integridade pode ser afetada por banhos longos e quentes, e até pelo uso excessivo de álcool em gel e sabonetes antibacterianos. “Se você usa um produto que promete matar 99% das bactérias, ainda sobrarão muitas, mas você pode matar aquelas que são úteis à pele”, diz o médico. Tomar muito sol sem filtro também é uma forma de agredir a cútis. É por isso que muita gente tem crises de herpes labial, doença provocada por vírus, depois que volta da praia. Ou adquire manchas nos braços e nas costas (pitiríase versicolor), provocadas por um tipo de fungo. O médico avisa que algumas famílias são mais predispostas a certos tipos de micro-organismos. Se a integridade da pele é afetada, você pode desenvolver um problema que nunca havia aparecido antes. E, acredite, pode até pegar gripe com mais facilidade. Cancer, while always dangerous, truly becomes life-threatening when cancer cells begin to spread to different areas throughout the body. Now, researchers at the University of Missouri have discovered that a molecule used as a communication system by bacteria can be manipulated to prevent cancer cells from spreading. Senthil Kumar, an assistant research professor and assistant director of the Comparative Oncology and Epigenetics Laboratory at the MU College of Veterinary Medicine, says this communication system can be used to “tell” cancer cells how to act, or even to die on command. In the study published in PLOS ONE, Kumar, and co-author Jeffrey Bryan, an associate professor in the MU College of Veterinary Medicine, treated human pancreatic cancer cells grown in culture with bacterial communication molecules, known as ODDHSL. After the treatment, the pancreatic cancer cells stopped multiplying, failed to migrate and began to die. Kumar says the next step in his research is to find a more efficient way to introduce the molecules to the cancer cells before animal and human testing can take place.